wp says my site already using by another account! Hello, I had previously installed a jetpack and connected my site. I had to reset my server later, but now I’ve reinstalled it but my site seems to be connected to another account. I’m sure I used this account on the previous link, but I couldn’t connect to my site. Adım izzetyilmaz.com ety site step. I’d appreciate it if you could help. The blog I need help with is izzetyilmaz.com. See if Jetpack is already active there, and click on that from the left menu. You can use Manage Site Connection to disconnect and reconnect to this account. If that’s still not working, reply back and staff might be able to check things out. 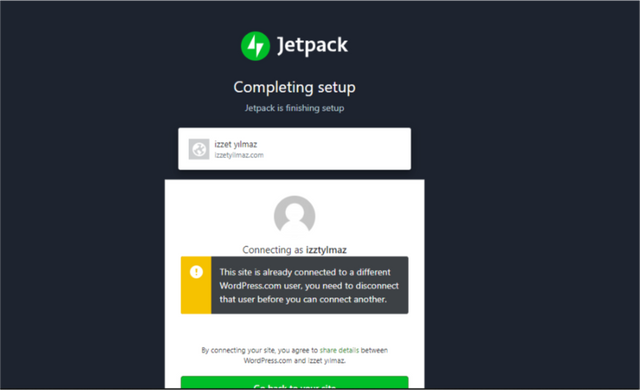 The usual Jetpack support is https://wordpress.org/support/plugin/jetpack but this forum can troubleshoot Jetpack issues as they relate to WordPress.com. It seems plugin is active and I can connect to dashboard but with error message. But there is no option like ‘Manage Site Connection’.